Unlock Samsung Galaxy Chat B5330 - Safe IMEI Unlocking Codes for You! 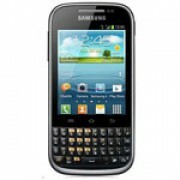 Unlock Samsung Galaxy Chat B5330 Handset! In case your Galaxy Chat B5330 doesn't ask for the code and there is no designated field to enter it, please DON'T PLACE ANY ORDER, contact us first for support. Are you trying to unlock your Samsung Galaxy Chat B5330 cell phone to use it with Any GSM SIM Card worldwide? If yes, SafeUnlockCode can do that for you with our Fast and Safe Unlocking Service! 100% Guaranteed to unlock your device! See The Complete Phone List! How to Unlock Samsung Galaxy Chat B5330 Phone - Tutorial! Please find bellow a step-by-step guide to follow in order to unlock your Samsung Galaxy Chat B5330. I need help to unlock my phone sumsung gt b5330. Can u pls provide me with unlock code? Can you please let me know if you can provide the unlock codes for Sprint New York? do I need to wait long for the code after I request it?